Nisei speakers share stories at Whitney High as part of district-wide event. From left: (back) Jason Fuji, Nancy Oda, Jenny Chomori, Ernie Nishii, district official Angela Fernandez, Dr. Larry Natividad; (front) Iku Kiriyama, Kanji Sahara, Misao Oka. ABC Unified School District recently held its first annual districtwide Day of Remembrance for all ABC high school students. ABC Unified School District is a K-12 school district that serves Artesia, Hawaiian Gardens, most of Cerritos, portion of Lakewood, as well as portions of Long Beach and Norwalk. Approximately 20,000 students are enrolled. ABC’s DOR was a weeklong event that provided a combination of incarceration art, artifacts, a shortened version of Jon Osaki’s “Yonsei Eyes,” and direct questions and answers between students and survivors of the Incarceration. 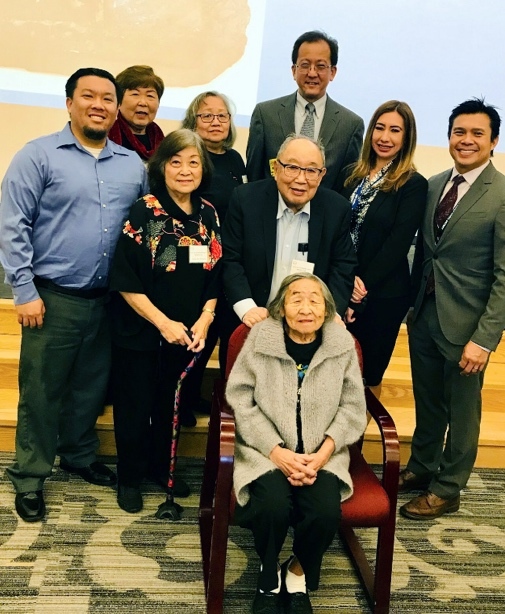 The survivors included Min Tonai, Kanji Sahara, Kunsho honoree Hal Keimi, Bill Shishima, Iku Kiriyama, Mike and Grace Hatchimonji, Joyce Okazaki, Jenny Chomori, Nancy Oda, Amy Tsubokawa, and Mary Jane Fujimura. In attendance at the various Days of Remembrance were Cerritos Councilman Frank Yokoyama, Assemblywoman Cristina Garcia, and ABCUSD President H. Ernie Nishii. The ABCUSD Day of Remembrance retold the tragic stories of the Japanese American incarceration camps from the prisoners themselves. A display included suitcases showing that incarcerees could only take what they could carry to camp. 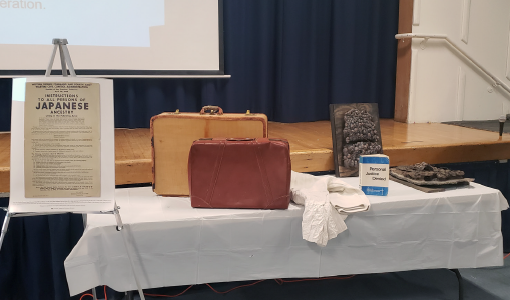 At Whitney High School’s event, the Nisei speakers talked about their unique experiences in different incarceration camps. Kanji Sahara shared about how even before the American concentration camps, he was one of the Japanese families that were segregated from the rest of society into ethnic ghettos. Since his childhood was spent living in an exclusively Japanese community, Kanji was shocked to find out that being Japanese meant that he was a threat to the United States. He felt confused and embarrassed that because of how he looked, he and his family would be forced to sleep in dirty horse stalls and scrounge for toilet paper thrown over the barbed-wire fence by military guards. Iku Kiriyama explained that after the war, Japanese kids would skip school on Dec. 7 in fear of being harassed. She couldn’t pinpoint why she still felt shame going in public on Dec. 7 or why that shame was still instilled in her even at 40 years old. She shared about how her brother was bullied for being Japanese until a Mexican “tough guy” stood up for him. Jenny Chomori broke down the difference between the true meaning of “concentration camp” vs. the euphemistic “internment camp,” and the importance of calling history exactly what it is. She discussed how euphemisms can water down crimes against our civil rights and can enable a repeat of history. Nancy Oda brought up the stigmatized topic of “No-No Boys” who refused to pledge their allegiance in Questions 27 and 28 of the loyalty oath and spoke about how her father’s divided loyalties between his Japanese heritage and American citizenship split up her family. Nancy’s father, Tatsuo Inouye, was separated from his family and young daughters while he was in the stockade. She further connected that experience to the current events of undocumented parents being separated from their innocent children at the border. Yuri Nishii is a student at Whitney High School. Her father, Ernie Nishii, is president of the ABC Unified School District Board.